Honeyfur wrote: Honeyfur purred quietly as the clan called out their new names. Hawkpaw-EmberClan wrote: "Runningtail, Halfice, Brownbriar, Sweetfur, Moonface, Honeyfur!" cheered Hawkpaw for her former denmates. Ivorypeak wrote: Ivorypeak padded into the EmberClan camp, carrying coltsfoot in his jaws. He made his way into the den he shared with Lemonpaw, placing the coltsfoot into the storage. Rosestar wrote: "Let all cats old enough to catch their own prey gather for a clan meeting!" yowled Rosestar from the rocks near his den. Shadegorse pricked up his ears and padded over to hear what Rosestar had to say. 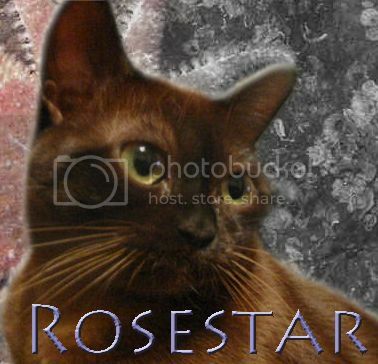 "I, Rosestar, Leader of EmberClan, call upon my warrior ancestors to look down on these apprentices. They have trained hard to understand the ways of your noble code, and I commend them to you as warriors in their turn. Echopaw, Frecklepaw, Sparrowpaw, Hawkpaw, do you promise to uphold the warrior code and protect and defend this Clan, even at the cost of your life?" "I do." meowed Echopaw, puffing out his chest in pride. "I do." meowed Frecklepaw quietly. "I do." meowed Sparrowpaw, puffing out his chest in pride. "Then by StarClan, I give you all your warrior names." continued Rosestar. "Echopaw, you will be known as Echopelt. Frecklepaw, you will be known as Frecklecloud. Sparrowpaw, you will be known as Sparrowfoot. Hawkpaw, you will be known as Hawkmist. StarClan honors you all and we welcome you all full warriors of EmberClan." Echopelt puffed out his chest in pride as the clan called out their new names. Frecklecloud sat quietly by himself, listening to the clan call out their new names. Sparrowfoot puffed out his chest in pride as the clan called out their new names. Hawkmist ruffled her fur, listening to the clan call out their new names. "Echopelt, Frecklecloud, Sparrowfoot, Hawkmist!" cheered Lionberry from his seat outside the elder's den.